This beautiful late mid-century modern house has recently been upgraded and fenced for complete privacy. Mature plants mixed with new ones, towering Palm Trees, a huge wrap-around lot featuring a pool, spa, water features in both the front and back yards, a fire pit, two hole putting green and outdoor bar make this property shine. Located just five minutes from the airport, and five minutes to downtown Palm Springs shopping and restaurants, you'll find this is the perfect place to escape while being close enough to it all. The game room, doubling e as a 4th bedroom, offers a full-sized murphy bed and bath making this room a fun pool-side escape. Each of the three formal bedrooms, as well as the main area of the home has it's own flatscreen television. The kitchen has been updated with new flooring, cabinets and stainless steel appliances. The open concept floor plan, dramatic high ceilings and huge windows provide the perfect place for gathering as a group. A large sofa wraps the main living space -perfect for conversation or watching a movie on the 55” flat screen television. The spacious layout of the living area also includes interior dining for six, and just off the dining area, if movies and conversation aren't your thing, you can enjoy PacMan, Donkey Kong, Frogger ... and 57 other games on the game table for those who want to reminisce their wonder years. The three bedroom suites feature hotel-quality mattresses, ample storage, direct access to the front and back yards, and individual flat screen televisions. The master, has a king-sized bed, direct spa access and an en suite updated master bath. The other guest bedrooms have mountain views and dual access to the hallway bath with tub/shower. The fourth suite has a full-size murphy bed with direct pool and patio access and it's own bathroom with walk-in shower. All four sleeping areas are spacious and handsomely furnished, giving each its own individual style and appeal. The windows and sliders along the entire back of the house reveal the gorgeous resort-style pool yard lined with mature palm trees and lush landscaping. The backyard oasis offers an outdoor covered dining pavilion, a water feature, pool, spa, fire pit and a four-burner gas barbecue. You’ll find that the owners have thought of everything. Sip your favorite drink poolside or at the outdoor pool bar. Spend leisurely afternoons on your poolside chaise loungers and evenings under the stars. 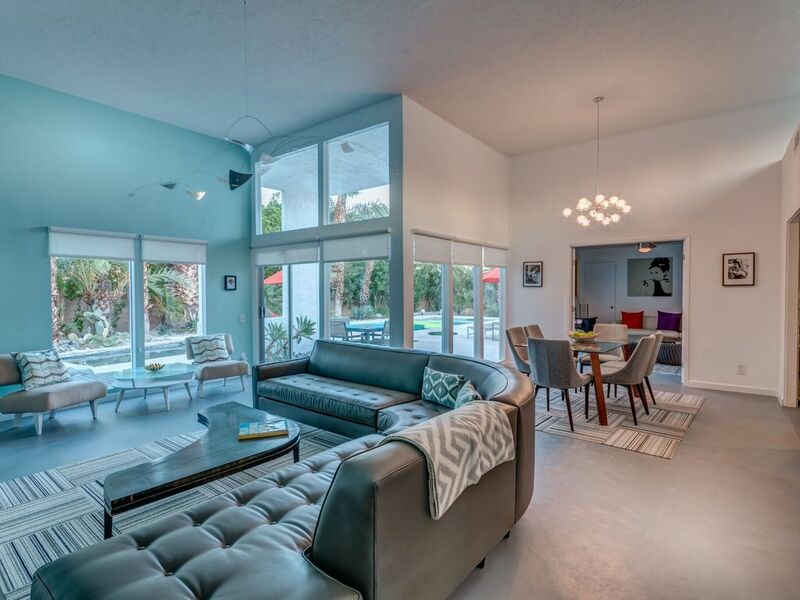 21 Palms is a very private paradise with all the conveniences of home. We looked at several properties in Palm Springs before making the decision to buy 21 Palms. While there are so many gorgeous places in PS, we could not find any that offered the high ceilings with the openness that we found in this property. We immediately fell in love with it and soon realized that with a bit of upgrades, we could make the property reach her full potential as a vacation rental and weekend getaway. 21 Palms was named for it's 21 rustic palm trees that stand on the property. We can't take credit for those since they have been growing for years. Privacy and the space the property offers is what this property offers. Every guest can have their own escape within the confines of the property. We are proud of the new additions of a front yard fountain, side yard putting green and back yard pool bar. We love to escape here, and hope you will too. Mountain views from each rooms with gorgeous dessert sunsets. The home was spacious and very pleasant. We had a very good time staying in there. Heated pool was center of attraction for kids. Would rate a 4 star rating, for they had some paint work in progress and the home climate unit was louder compared to silence in and around the property(specially during nights). Overall very comfortable indoor and outdoor and would definitely recommend it to others and visit in future. I'm so glad we'd selected this house out of the many available to rent in Palm Springs. The high ceilings and natural light make this home a dream. It's tastefully decorated - and the accommodations were spacious and cozy. We were a small group - 4 women - and it was great for each of us to have our own comfortable beds (even the murphy bed! ), nice bedding and plenty of bathrooms. The kitchen is great- there were a selection of appliances and utensils to prepare the simplest to gourmet meals. Not only was there a fridge, but a wine fridge and a mini-fridge in the outdoor cabana. We dined inside and alfresco - the barbeque was sweet! While the interior features were fantastic, the outside was the BEST, dreamy! The pool was the perfect size and temperature, the hot tub a nice reprieve from the long day, couches around the fire pit (even though we didn't turn it on), the light features, everything! Seriously a fancy, fun way to spend the long weekend - different from our daily grinds. The only thing I wish we had was more time to enjoy the hammocks and put-green. Mark was one-step ahead of the game when it came to helping us - he called the day before, was readily available when we arrived. He had intended to meet us a the property and give us a tour, but had an unexpected injury and did not. He gave us instructions on how to get in (easy! ), then walked us through all we needed to know about the house. He stated he was available at any time should we need anything or have any questions, but the house had it all! We left the house only wishing we'd stayed a few more days. Thanks Mark for a great getaway house! We had a terrific time staying here. Good spaces both indoor and outdoor. Beds are very comfortable. We had 3 couples so we each had our own bathroom. There is a grocery store just a few blocks away and it's in close proximity to the airport. We would definitely stay here again. I see the price has skyrocketed since we stayed there. I wouldn't stay there for the $688 a night they are charging now as there were things that needed attention that were easy to overlook when we paid an average market price. We had a great stay here. All of the amenities were great! The grounds and landscaping around the house were extremely nice. We loved the pool (although very shallow), hot tub, BBQ, and the fire pit. The place was very clean and spacious for the four of us. We did not like the cameras in the back yard though. Plenty of towels, extra linens, washer and dryer. Complete relaxation near the hustle and bustle o downtown Palm Springs! Me and my girlfriends stayed at this gorgeous home for my Birthday in a September 2017. We had such wonderful accommodations, and they greeted us at the house with smiles and all the info we would need. Hopefully I will stay here again! I most certainly recommend this Home to anyone else lucky enough to stay! What a pleasure. Booked this property to celebrate my husband's 40th birthday and we had an absolutely wonderful time! The property lives up to all the photos online and kept our group of 6 content & comfortable during our stay. It was so nice to be received by the Property Manager who checked us in, gave us a tour the house and highlighted the rules/regs vs. having to read it online or on a piece of paper. We weren't far from the freeway, shopping outlets were nearby (~20 min away) and downtown Palm Springs was right there (5-6 min drive)! The 4th "bedroom" doubled as a game/lounge room and the guys enjoyed playing with the old school arcade game in there. We also liked that in addition to the A/C in the house, there was a fan available in every room in case we needed it. The most enjoyable part of the house (where we spent the most time) was the backyard - lounge chairs & sofa, grill AND the pool were just the respite we needed from our daily grind. We enjoyed our time at 21 Palms so much that we are already looking to book the house for next year! Thank you for this wonderful review Aurelie. We're delighted to have you and your group and so glad you were able to celebrate your husband's party at the house. You guys are wonderful guests and we look forward to your groups' visit next year.